21st Century Leaders is one of the many clubs at North Springs that works on promoting leadership skills to all student members. According to club president Evan Rosenthal, “We just want to get the students involved in the community both in and outside of school. 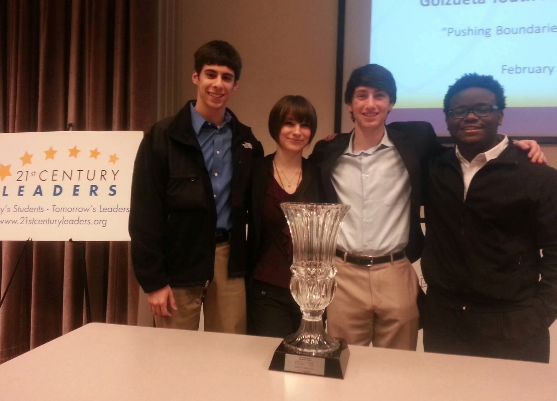 They recently entered a marketing competition called Goizueta Youth Leadership Summit and were awarded the glass trophy for the third year in a row. Five Spartan students were on the winning team: Justin Fleischmann, Evan Rosenthal, Caroline Stadler, Gabriel Pereira, and JT Bell. There is a parent organization called 21st Century Leaders that sets up the team competitions, and they recently set one up at the Emory campus in Atlanta. In the competition, students’ abilities to create business plans, set business objectives, and design marketing strategies were tested in a creative competition in which competitors had to grow and maximize profits for a fictitious company. They then presented their plan to Emory professors and business professionals.“We were given a business case, which is just a competition where they give you a scenario and you have to give the best answer and be able to justify your answer based on what they want you to talk about,” said Rosenthal. Specifically in this competition, the students were given a company that wanted to expand. Different teams were required to help their business plan by choosing things like where the company should open up more stores, etc. “We ended up choosing Charlotte, North Carolina out of Charlotte, New York, and Los Angeles,” said Rosenthal, “we chose Charlotte because there was less competition, the graphics looked better, and we just thought we’d have a better chance there.” The competition was scored out of thirty points, and all teams placed within five points of each other. The judges said they chose the best presentation based on who had the most facts, which turned out to be our very own Spartans.